Returning to the Black Hills! Back Home in the Hills! I don’t know if it is possible to be sad, happy and excited all at the same time but that is how we felt as we pulled out of the Finken farm on Sunday the 20th. Although we were there 3 weeks it seemed like it was just a couple of days. From Douglas we went on a quest, a manhunt so to speak. We had heard that our elusive friends Dino and Lisa were in the area of our travel route through Minnesota. The problem was that we did not know exactly where they were. You see, Dino and Lisa are in the witness protection program and are always in an “undisclosed location” so we had absolutely had no idea where to start. Just for the heck of it Barb plugged in “undisclosed location” into our Garmin GPS to see what popped up. The little dial on the display spun and spun and spun, pretty soon the unit shook and smoke started coming out of the top and then the unit displayed coordinates! Could it be? Could our reclusive friends really be within 300 miles of us? With anticipation levels high we followed the directions on the GPS right into the city of Fergus Falls. Then things really started to get crazy…..right here, left there, another right clockwise around a roundabout three times, counterclockwise once…. Next thing we knew we were winding our way through a remote campground where way, way in the back corner we could see the front of a Cardinal 5th wheel! As we approached there was no one around but we did see movement on one of the shades inside the rig like someone was peeking out. Pretty soon Lisa bursts out the door like she is all excited to see us. It was a good act as we knew they did not want to be found. On the other hand it was as though they knew we were coming as they had Tri-tips and cold beer waiting for us! Lisa’s mom stopped by as well and we all spent the night sitting around the fire catching up and making plans to get together this winter in Florida. Barb, Beverly, Lisa and Dino ready to rip into some tri-tips! The next morning we were off to spend the evening with my brother Bob and his wife Greta in Taylors Falls. We had not seen them in almost a year and again spent the night getting caught up. The next morning we had a couple of hours before Barb’s doctor appointment so we visited Kevin at one of his job sites and surprised our old neighbor Chelle and got a tour of their new house that Kevin and his crew built. You can see come pictures of their awesome work here. The doctor appointment went well and Barb was sent off with instructions to return in July so we were off to our place in South Dakota. Although it was only a month, it seemed like we had been gone much longer. We were worried about keeping the prairie dogs from invading from the neighboring property but the Jordan’s came to the rescue and kept them at bay while we were gone. Thank you Jim and Brenda! They had also taken care of our mail and one of the packages awaiting us was Barb’s new camera! Yes, she got a camera. In fact she ordered it within minutes of proof reading the last blog post. Just to make sure that we had no money left for a spotting scope, she not only bought one camera, she bought two! The first camera she bought was the Panasonic Lumix ZS-70. It was a step up from her old ZS-50. The other camera she ordered was actually for me. Over the past few months my camera had started to act up. The shutter button no longer worked, the only way it would take pictures was with the remote shutter release and more recently it would continuously turn on and off every 10 seconds. I could take pictures but I had to time them between these cycles. She got me the FZ-300 which was a step up from the FZ-200 I had. Wait it just dawned on me that if she got me a camera for Mother’s Day….does that mean she thinks I am a mother …..? Nah, I must have just deserved it! After playing with hers for a little bit she decided that she did not like it. It was heavier and bigger than she wanted. Me? I love mine and cannot wait to get out there and take some pictures. Before doing that though I ordered and am reading Grahm Houghton’s guide book for this specific camera so I know all the ins and outs. Barb ended up returning hers so it was a win/win for me, I got a new camera and since she returned hers, maybe we have enough money for that spotting scope! Thanks to the Jordan who kept the prairie dogs in check the grass is really growing. Both bluebirds and swallows were inhabiting our birdhouses when we got back and it is time to get back to work. Our major project for this week is installing the cistern pump so we can finally get water out of our tank. We ordered it over a month ago and had it shipped to the farm and now that we are back I can install it. I was so intent on the installation I did not take one picture! The grass is really growing from all the recent rain! Life is good in the hills, happy to be back and looking forward to spending the next few weeks continuing to work on the property and exploring the surrounding area….. It was another crazy busy week here at the farm. I don’t think we had one day shorter than 12 hours. 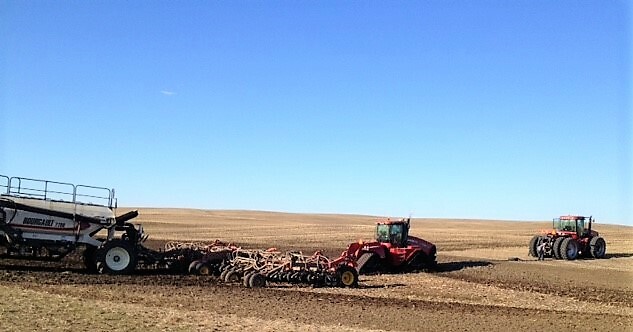 Busy planting, rolling and running trucks to and from the field. Barb went to Minnesota for a few days for some planned surgery and spending a few days with my sister. She is now back recovering and is getting better every day. The last of the crops went into the ground on the 17th which Bob said was the earliest they have ever had them in the ground. Not bad when you are planting 4500 acres! Just in time too as the next day brought much needed rain to give the crops the moisture they needed. There are studies that show that your yield increases by up to 1 ½% for every day you have your crops in early (or decreases for every day late) so hopefully getting them in early will yield great results! With only a few days until Mother’s Day I had to decide what to get Barb as a gift. She said she wanted a camera but I kept having a reoccurring dream that she wanted a new spotting scope so she could see the deer better while sitting at the rig at our property in South Dakota. She already has a perfectly good camera. Sure it has dust on the lens and sure it does not focus all the time and maybe the zoom gets stuck once in a while, but other than that it is perfectly functional. And the spotting scope, well the one we have was fine when we got it many years ago but now they make such nicer ones and I really think she deserves one of those! And this reoccurring dream must mean something right? As it ends up she got neither, I made her a cake. Well, I kinda made her a cake. We have been working so much at the farm I had not had a chance to go to Minot to look at cameras, spotting scopes or get her a card or anything else. We have literally been busy from 6:00, 7:00 in the morning until 8:00 to 10:00 at night. In the meantime Barb has been on line looking at cameras and talking to B&H Photo on the phone trying to pick out the perfect camera. I have not seen her or heard her researching spotting scopes, I can only assume she is doing that when I am out in the field. Thursday before Mother’s Day I started to panic and was resolved to the fact that she was not going to get a camera or a spotting scope so I texted Holly at work and asked her if she could pick up a cake mix and frosting. The least I could do is make her a cake. With cake mix on the counter I walked by it the next two days trying to figure out when I was going to make it. Finally Saturday morning I found the time…..when Holly offered to make the cake for me. All I had to do was frost it! Barb loved the cake but when, Mother’s Day came and went without a camera or a spotting scope making an appearance Barb said she wanted a “do over” sometime in the next few weeks when we had time to go out to dinner. Speaking of diner, we get out three times; once with Dan and Jeannie and two times with time with Bob, Deanne joined by Dylan on one of those outings. We went to Ebeneezer's Irish Pub in Minot with Dan and Jeanie. We caught up and made plans to get together this winter in Florida. The food was excellent, and would highly recommend it! Our other dinner was at the Hitching Post in Benedict a small town bar where the special of the night was a hot roast beef sandwich. We were so full by the end of the meal we all about fell asleep on the way home. Our second adventure with Bob and Deanne included some sight seeing to see the one and only railroad tunnel in the state of North Dakota. Given the fact that the state is so flat there is not a lot of need for tunnels in the state. Even more amazing is the fact that this tunnel located in the Sundheim Park and Recreation Area was never used. 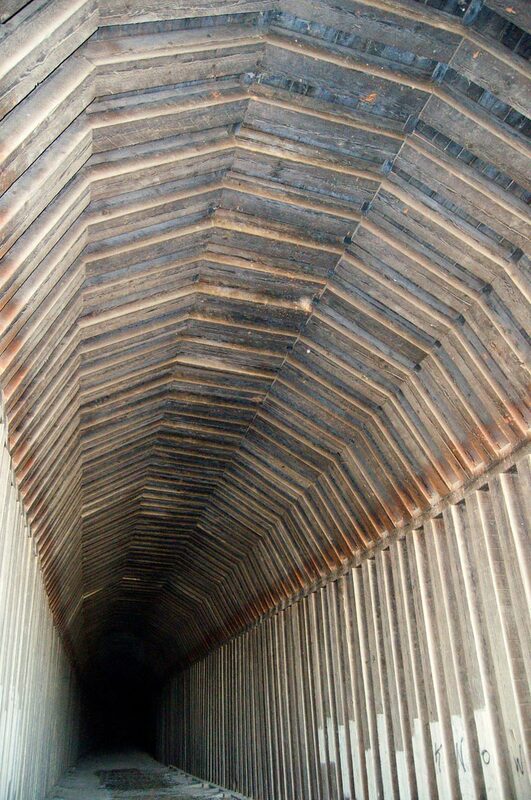 At just under 1500' the tunnel was built in 1913 using mules and built entirely of timbers. Adjacent to the tunnel is another interesting attraction. The Fairview lift bridge was built at the same time as the tunnel to accommodate steamboat traffic on the Yellowstone River but like the tunnel it never really went into use. It was lifted just once for testing in 1913 as steamboat traffic stopped on that river before the bridge was ever completed! 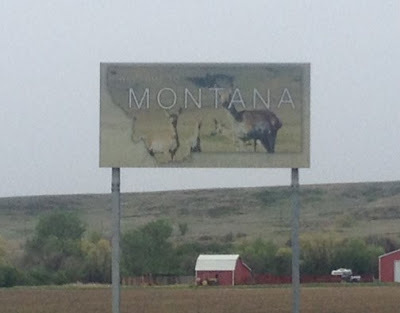 Since these sights were only a few miles from the Montana border, we drove down the road just to say we went to Montana! We ended this adventure with one more one and only (well maybe only). Bob and Deanne's first flight of beer. These beer tasting newbees are not big fans of beer but after reading our blog for the past few years wanted to give it a try. So we stopped by Stonehome Brewery in Watford City where we learned a couple things.....Neither Bob or Deanne like dark or sour beer but they did find a couple of lighter and fruitier beers that they did like. In fact their favorite along with mine was the Dakatoh Zen while Barb's was Teddy. I did have a couple more interesting encounters. The first was a moose sighting in one of the fields nearby. Although not common there are several living in the area. The second encounter involved the Air Force. I was picking up some trash in the ditch when a military helicopter flew by very low, just above the power lines. A little while later a truck pulls up to me with Federal Law Enforcement written on the side in large letters. It pulls over to where I am and asks me what I am doing. “Picking up trash” I explain. The guy driving then says that they have “sensitive” cargo coming through and to stay away from the road. Sure enough a few minutes later here comes 12 Humvees and another helicopter which all surrounded at long semi-tractor trailer. They must have stopped traffic in both directions somewhere down the road as there was no other traffic either way for a while. With all the missile silos in the area it does not take a rocket scientist (ya, I just said that!) to know what they were moving. The ever present wildlife made for some great photo ops. Too bad Barb's camera is on the fritz, she could have taken some! 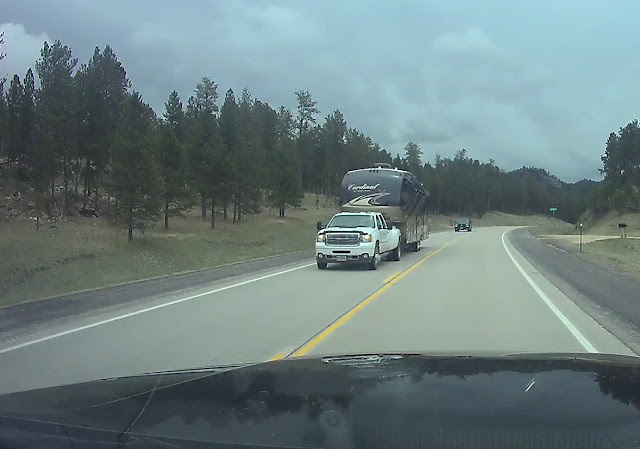 We left Pringle on May 1st and evidently passed the Jordan’s on the highway as we were sent this picture from their dash cam! We arrived at the Finken Farm in Douglas North Dakota on May 2nd about noon after spending the night at a quiet little free campsite on Isabel Lake just outside of the town of Iasbel, SD (population 144). We found this campsite on Free Campsites.Net and it served our purpose just right for an overnight stay. There was still ice on some of the larger bodies of water and pockets of snow in some of the shady spots when we arrived but those did not last long as the temperatures over the next few days reached well into the 70’s and even the 80's! They were only 2 days into their planting season so there was plenty to do. Planting can take anywhere from 20-30 days depending on weather, soil conditions and mechanical issues but this year they bought me a new toy. 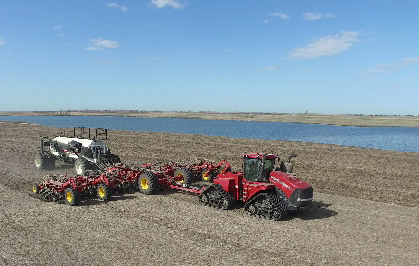 With the purchase of a seeder, tractor and seed/fertilizer cart they now have two rigs in the field at a given time usually going 12 – 20 hours a day. Of course they don’t let me drive these rigs so it is a more of a look but don’t touch type of toy. I put together a short video showing it in action. It also give you an idea of what find of terrain is in the area and why the duck hunting is so good in the fall! Chris and Bob do most if not all the planting as this is the most important part of their livelihood. If you don’t get the seed in the ground right you don’t have a crop. 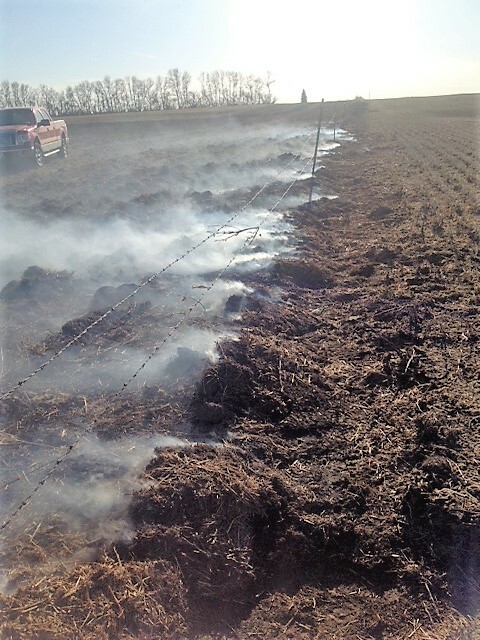 Their two air seeders plant 60 and 72 rows at a time and if one or more of these tubes gets obstructed that means nothing was planted leaving an unsightly field and a loss of income so they have to carefully watch the monitors and seeder to make sure everything is working properly. So far they have planted chick peas, wheat and field peas. But even within each of these they are planting different varieties of wheat and peas as each may have different yields, growth rates or other characteristics. 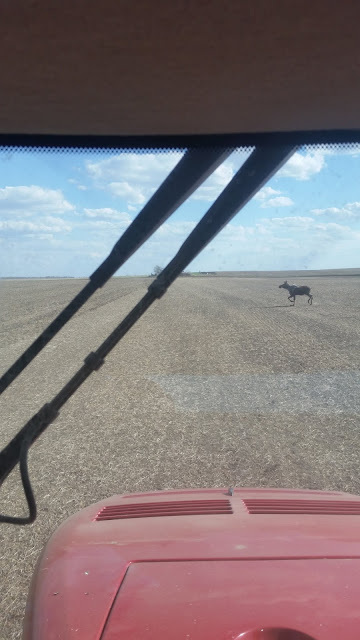 With those two seeding that leaves Dylan and me to make sure they have everything they need in the form of fuel, seed and fertilizer to keep them up running. Since they are also seed dealers they are busy prepping and loading seed for other area farmers as well. Prepping seed consists of looking at the days needs for both their customers and their own field work and orchestrating the trucks, carts and seed treater to make sure everyone has need when they need it. This year they added a seed treater to their list of equipment which allows them to treat some of their seed with fungicide saving them money and allowing them to offer this service to their customers. To treat the seed you have to set up the grain conveyor which dumps the grain from the bin into the hopper of the treater. The treater has a reservoir which contains the specific fungicide for that grain. Then you set the ratio for that specific seed. In addition to the seed we have to deliver fertilizer to Chris and Bob as well. So far we have used 3 types of fertilizer; Urea, S-10 and inoculant. Urea contains a ratio of nitrogen, phosphorus and potassium and is produced naturally in animals and humans. S-10 is a starter fertilizer containing nitrogen, phosphorus, and sulfur that are fused into one nutritionally balanced granule and helps the plant get a good start to their growing cycle. Inoculants are an interesting product as it is basically alive. It introduces a naturally occurring bacteria making the plant stronger and increases yield. When all that is done you have to roll the peas in order for them to start growing, This entails going over the pea field with a giant rolling pin to push down the ridges, reducing moisture loss and increase seed to soil contact. Other farm activities this week included using the rock picker to clean up a few rocks, putting out a fire along a fence line. 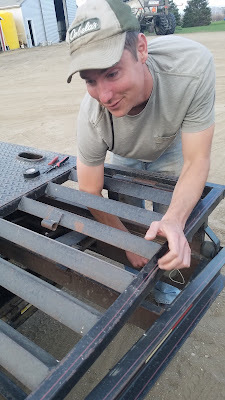 The funniest thing of all....watching Chris get his arm stuck on a trailer. He was wiring the lights and put his arm through an narrow opening to get at the wires and could not get it out. Dylan and I just sat back laughed and took pictures as it took him a minute or two to wiggle it out! In addition to all the farm stuff we have been working/experimenting with Daisy and Dakota on couple of things. 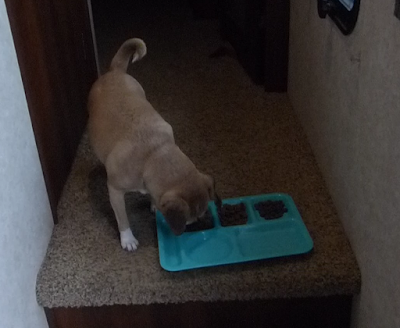 Daisy is a finicky eater. Well, that is not true, what I mean is that different foods affect her in different ways. She can’t eat chicken as she breaks out and constantly scratches and chews on her paws. We have tried a variety of different foods trying to find one that she likes and does not make her itch. A week or so ago Barb stopped by a small pet store in Hot Springs trying yet again to find the perfect food. Barb was explaining our dilemma to the owner who prompt gave Barb about 20 different samples and told her to try these and see which one works these works best. So the experiment began! Barb would open three of the samples placing a small amount of each in three compartments on a tray. It is hilarious to watch her! When Barb would be preparing the tray Daisy would be jumping up and down watching her and when Barb would set down the tray Daisy would run over and systematically go down the row of food smelling each one. Sniff, sniff sniff. She would repeat this “sniff test” no less than three times before deciding which one to eat. Barb would note which one she ate first, which one she ate second and which one she totally snubbed and would not eat at all. Her next feeding Barb would change the order in the tray using her first and second choices and adding a new third choice. Every single time she ate Taste of the Wild Prey Trout mix first and Taste of the Wild Roasted Lamb second and totally snubbed the third choice she was given. It did not matter where on the tray each was placed, that is how she ate them. And, she did not scratch or itch at all so we have a winner! Of course it had to be one of the most expensive dog foods but Barb went to the store and purchased a big bag of Trout mix she liked the best. We have been working with Dakota (by “we” I mean Barb) on hand signal and whistle training and I am told it is going very well. Week one is in the books here in North Dakota and it is good to be back!